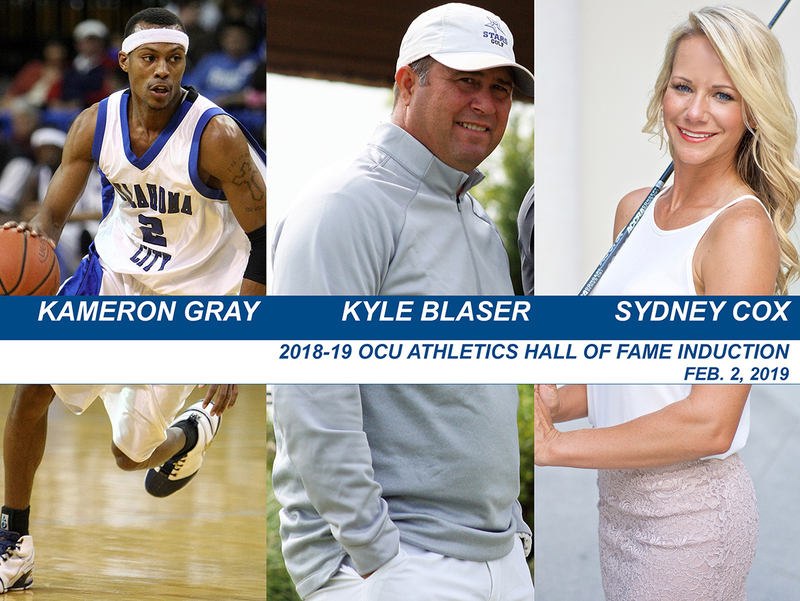 Oklahoma City University men’s golf coach Kyle Blaser; alumna Sydney Cox, who won the individual women’s golf national championship; and Kameron Gray, two-time NAIA Division I men’s basketball tournament most valuable player, will join the OCU Athletics Hall of Fame. The 2018-19 OCU Athletics Hall of Fame induction class will be celebrated at a luncheon 11 a.m. Feb. 2 inside the Great Hall of the Tom & Brenda McDaniel University Center. Tickets to the ceremony cost $25. Order tickets by contacting Toni Adams at (405) 208-5309 or tjadams@okcu.edu or online here. 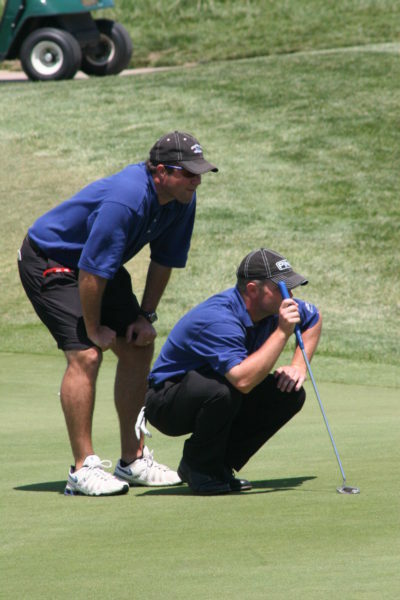 Blaser has guided Oklahoma City to 11 NAIA men’s golf championships, more than any coach. He has been the NAIA national coach of the year 10 times, also the most ever by anyone, as well as Dave Williams NAIA coach of the year nine times as awarded by the Golf Coaches Association of America. Oklahoma City has won 20 Sooner Athletic Conference championships and 11 regional titles and in 22 seasons under Blaser. Blaser has directed the Stars to national championships in 2001, 2002, 2003, 2004, 2006, 2007, 2010, 2012, 2013, 2016 and 2018. In 2017-18, Oklahoma City took its 11th national title in May in Silvis, Ill. Four OCU golfers collected all-tournament honors as the Stars established a program record for a 72-hole score and erased an 11-stroke deficit after the first round. The Stars snagged their fourth consecutive conference championship in the SAC Championships in April at Gaillardia Country Club in Oklahoma City. OCU seized seven tournament victories while posting a single-season team record scoring average last season. OCU, currently ranked No. 1 in the NAIA, has 118 tournament victories, including four wins this fall, under Blaser. In his time at OCU, Blaser has coached five NAIA individual champions and national players of the year, 80 all-Americans, 53 GCAA all-Americans, 27 NAIA scholar-athlete award winners, nine CoSIDA academic all-Americans, eight all-Nicklaus selections, 13 conference individual champions and 13 SAC players of the year. Blaser has been inducted into the NAIA Hall of Fame and the GCAA Hall of Fame. He has twice guided the United States’ top junior players in international competition. Several former Stars have turned professional around the world. Tyrone Van Aswegen became the first OCU alum to gain full-time status on the PGA TOUR in 2013. “Three people kept me staying here,” Van Aswegen said. “The first one was Coach." He always spoke about family. He always welcomed me and made me feel at home. Coach helped me and developed my skills. Cox captured the 2009 NAIA women’s golf individual championship. She will be inducted into the NAIA Hall of Fame as part of the 2018-19 class. She is the first women’s golfer to take the honor. Cox, a three all-American, contributed to four national championship teams for the Stars from 2005-09. Cox became a two-time NAIA Championships all-tournament performer, three-time all-conference golfer, two-time all-NAIA Region VI choice and two-time NAIA scholar-athlete award winner. Cox posted a 78.03 scoring average with four tournament victories. Cox closed her college career with a 76.19 stroke average in 26 rounds as a senior in 2008-09. She is tied for the career record with four eagles. Cox aided the Stars to four SAC titles and two regional crowns. Cox, from Edmond, Okla., competes professionally on the Symetra Tour, Suncoast Series Tour, CN Canadian Women’s Tour and Australian Tour. Cox took her first pro win in June in Mayetta, Kan.
Gray became the sixth player ever to be named NAIA Tournament most valuable player twice. He garnered the award while leading the Stars to national championships in 2007 and ‘08. The NAIA named Gray to its 75th anniversary NAIA Division I Tournament all-star team in 2012. As a senior, Gray was named honorable-mention NAIA all-American, Basketball Times second-team all-American as well as all-tournament. Gray, originally from Oakland, Calif., tallied 14.6 points, 4.0 rebounds, 6.0 assists and 2.04 steals per game in 2007-08. As a junior, Gray produced 11.0 points, 3.5 rebounds, 4.8 assists and 2.11 steals per contest. Gray finished his OCU career with 747 points, 220 rebounds, 316 assists and 125 thefts and averages of 12.5 points, 3.7 rebounds, 5.3 assists and 2.08 steals a contest. He led the Stars to two SAC regular-season crowns and the 2008 SAC Tournament title while becoming the tournament hustle award winner. Gray was given the Jim Wade Award twice as OCU’s male student-athlete of the year. “He was the consummate leader,” former OCU coach Ray Harper said of Gray. “He was the guy who could always make guys around him better, which great point guards do. I always felt like we had a chance to win when he was on the floor.